SiliconBlue® Technologies has announced availability of the iCE40™ mobileFPGA™ (field-programmable gate array) family of CMDs (custom mobile devices), dubbed “Los Angeles”. The iCE40 family consists of the LP (Low-Power) series - which SiliconBlue has designed for smartphone applications, and the HX (High-Speed) series - which they are targeting at tablets. SiliconBlue is fabricating the new devices in a low-power 40-nm standard CMOS process at TSMC, resulting in twice the logic capacity of the company's previous 65-nm devices, according to company CEO Kapil Shankar. SiliconBlue, headquartered in Santa Clara, CA, was founded in 2006 and until now has focused their sales force primarily at consumer electronics companies and ODMs (original device manufacturers) in the Asia-Pacific region, including China, Taiwan, Korea and Japan. Customers include Samsung and LG. The company is now looking to expand their business in the U.S. and Europe. The CMD, or custom mobile device, is descriptive of SiliconBlue's business model as well as their target applications. The company works with customers to define system-level requirements, but then SiliconBlue directly implements the design from their RTL (register-transfer level) IP (intellectual property). This can be done by SiliconBlue's teams in China and India in as little as 2 weeks for a small design, with an average time to prototype of 4 to 5 weeks. Shankar explains that his Asian customers are used to getting ready-made custom designs from chip vendors, rather than implementing programmable designs on their own. With typical smartphone development times of only 6 to 9 months, there is no time to produce a "reactive" ASIC (application-specific integrated circuit) in order to add features and functions, he says. 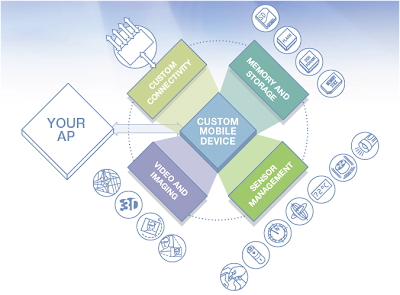 Designers use SiliconBlue CMDs as companion devices to application processors, to add support for functions such as sensor management, high-speed custom connectivity and HD (high-definition) video and imaging. The CMD enables product differentiation, according to Shankar, especially in smartphones where competitors may all be using the same underlying processor and operating system, such as Android. SiliconBlue customizes the mobileFPGA by programming a NVCM (non-volatile configuration memory) - essentially a OTM (one-time programmable memory), that the company integrates into their SRAM-based (static random access memory) FPGAs. (See "Activity picks up in non-volatile memory IP"). SiliconBlue eschews the typical FPGA method of using Flash programmability, which allows them to lower cost by manufacturing in standard CMOS processes. In order to achieve the low power that is so critical for mobile applications, SiliconBlue employs full CMOS LUTs (lookup tables) to minimize supply leakage. The mobileFPGAs also include power-down functions on every LUT, interconnect line, ALU (arithmetic logic unit) and MUX (multiplexer). SiliconBlue says that the new Los Angeles family of mobileFPGAs are the industry’s first to be available in a 2.5 x 2.5mm micro plastic BGA package. The iCE40 LP-series, which is 50% faster than the previous generation 65nm devices, will be available in 640,1K, 4K, 8K, 16K logic cell configurations. The LP can be operated with up to a 90MHz pixel clock to support WXGA (Wide eXtended Graphics Array) graphics resolution of 1366x768 for 720p displays. For tablets, you can operate the HX-series CMDs with up to a 150MHz pixel clock to support WUXGA (Widescreen Ultra eXtended Graphics Array) 1920x1200 resolution with dual LVDS (low-voltage differential signaling), HD720p 60Hz (1280x720 resolution) and HD1080p 30Hz (1920x1080 resolution). The HX will be available with 4K, 8K, 12K, 16K and 24K logic cell capacities. The iCE40LP8K and iCE40HX8K, 8K logic cell, LP–Series and HX–Series devices are available now. Smallest package devices start at $1.99 USD in high volume. SiliconBlue expects most members of the Los Angeles mobileFPGA family to be in full production by Q4 2011.